Thanks you with all of our heart. Your love and belief is the most precious motivation to the team behind Bankcoin project. Let’s see which team is going to play today in our World Cup 2018 and we guess that missing out the betting chance also doesn’t feel so good. It’s time to place your bet on our ABBetting to earn your prize today. ABBetting FIFA World Cup 2018 Contest is live now! World Cup 2018 lovers are surely immerging yourself on every exciting and nerve-racking moments of this world-class sport event. It’s not all about what you can enjoy in your football season. 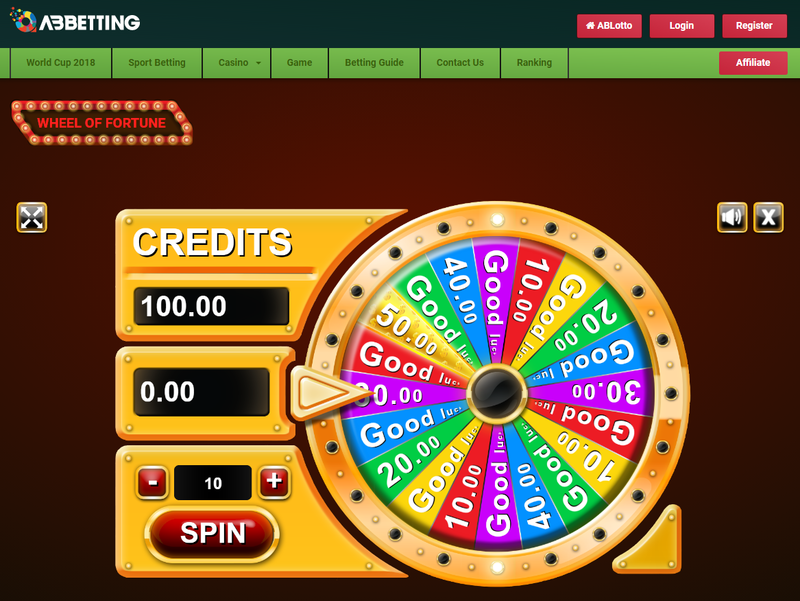 ABBetting will amuse you with our incredible contests including DAILY CONTEST and FINAL CONTEST. 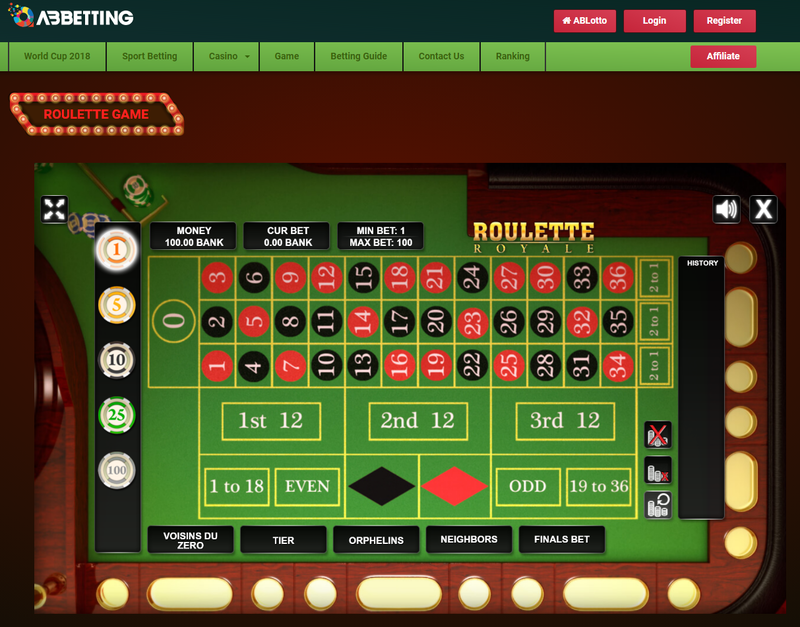 How to determine the best bettor? We count all the bet amount one bettor placed of the day. Then we rank all bettors. The winners are those who rank first, second and third in terms of how much your bet is in total. From the end of the Group stage on 29th of June until 15th of July, we will pick the best bettor and he/she will win the best prize of 9999 BANK for this World Cup event! How do we pick the best bettor? We count all the bet amount one bettor place during the Final CONTEST stage. Then we rank all bettors. The bettor who ranks first with the biggest amount of bet will be the winner. BankCoin reserve the right to change, modify, add or remove these terms and conditions if needed. I expect good luck for the project! Impeccably activity, sober website, pretty good approach. Thanks for the nice feedback. We will try to better ourselves everyday. • For those who has directly invited your friends to place bet on ABBetting, you can get 5% Commission. • For those who has directly invited your friends to place bet on ABBetting and is holding 10,000+ BANK on your ABLotto (ABBetting) balance, you can get 15% Commission. Join now. We guess you can’t wait more! BankCex is going to get several remaining parts done including Deposit and Withdrawal features. Besides, the page for Partner info is also under development. 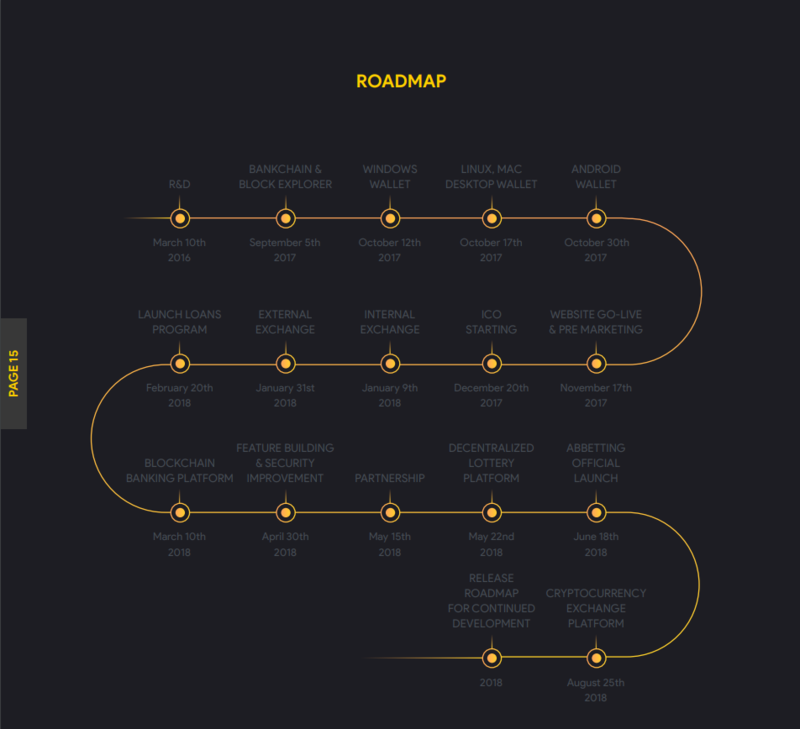 As we have planned before, BankCex is proposed to be officially launched in August; however, the team are speeding up to complete BankCex part by part in order to release it sooner if possible. Please hold truth and give us enough time. How long will this project last? CONGRATULATIONS JACKPOT 6/49 BIG WINNER! 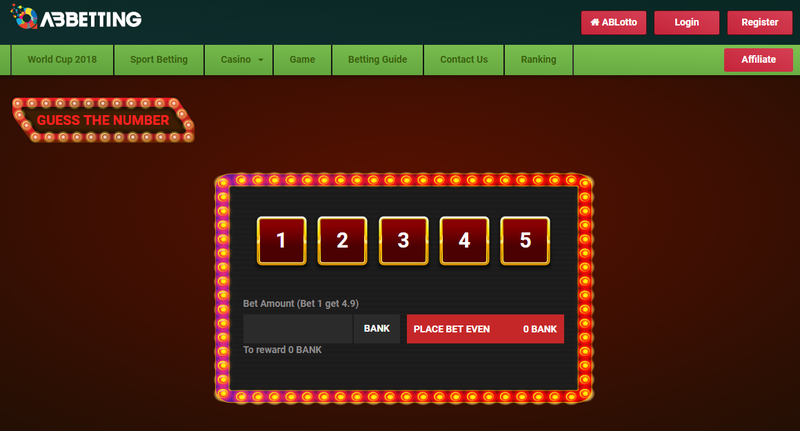 The first Jackpot won in ABLotto is up to 239428.60678486 BANK, 0.00160968 BTC and 0.03192952 ETH. Let’s help us in congratulating Brinley on his Big Win! Congratulate our best competitors on BankCoin Impression 2018! We have received a huge number of stories expressing your feeling and thought about the impressive parts of BankCoin project. BankCoin team would like to give you sincere thanks for that. After thorough assessment and hard decision, we have shortlisted and selected 5 best writers in the Competition. 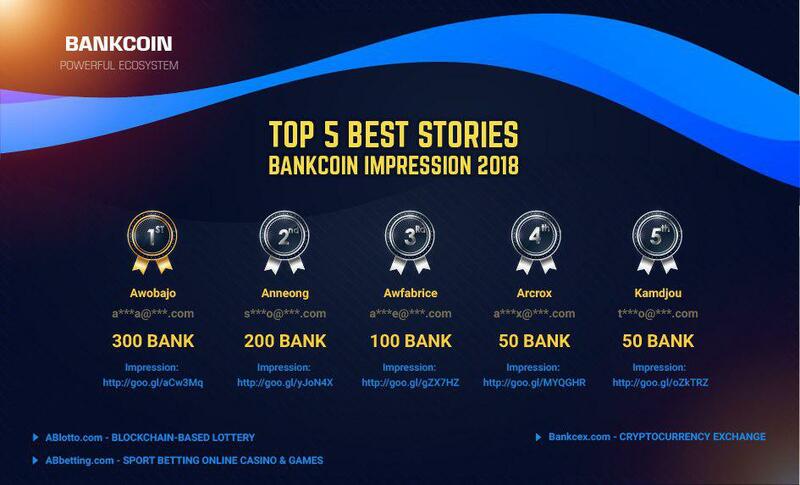 It’s time to say congrats to them and cheer for our project on receiving a lot of love and truth from BankCoin fans around the world. BankCoin reserve the right to amend this result announcement in case of necessity. All competitors have 3 days to submit your unjustified complaints if any. 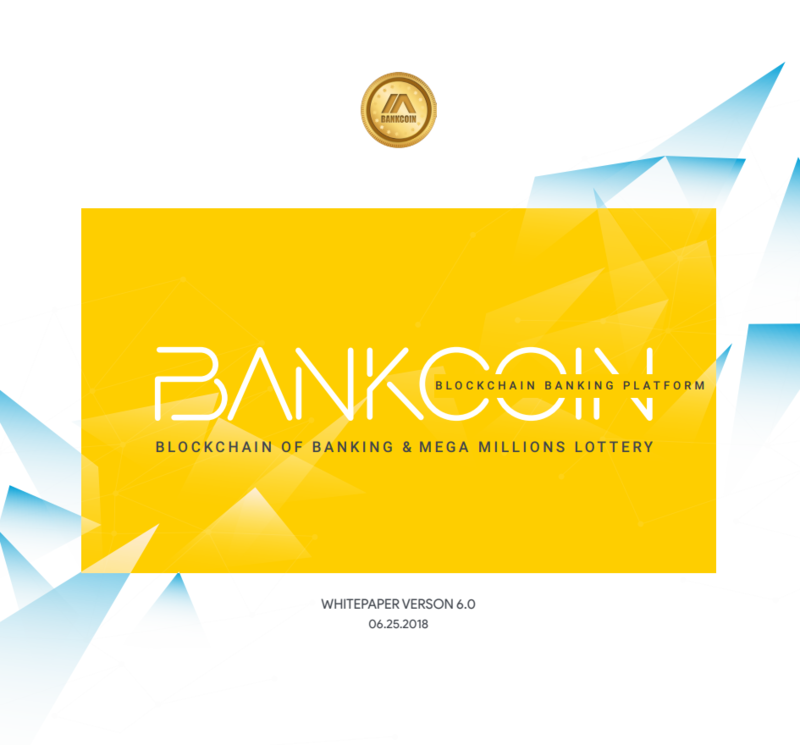 In case that this result has no changes or amendment, BankCoin will reward our best competitors on July 2nd, 2018. This team continues to surprise me. They are delivering a real world products in a timely manner and excellent quality. 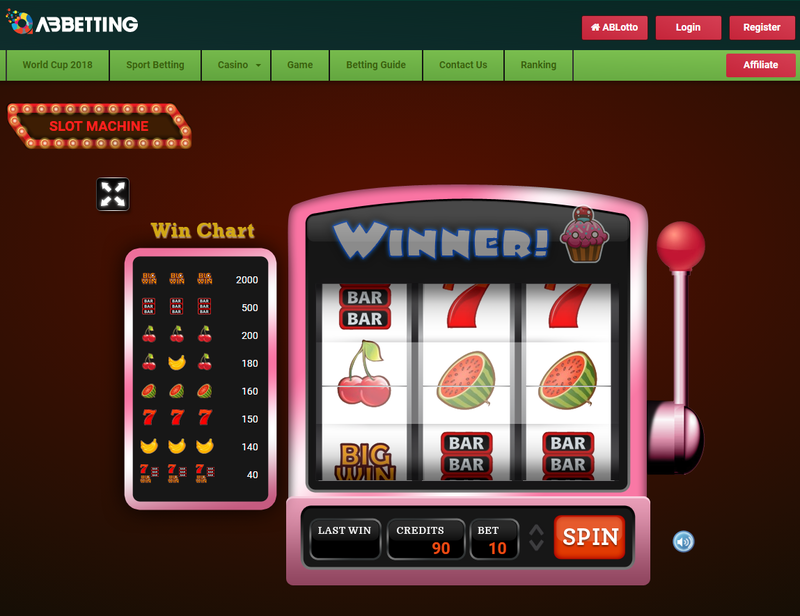 The abbetting platform is the latest one and it is well developed with a friendly and nice user interface. Thanks so much for nice reviews. We are working much harder to make more amazing achievements for the project as well as the whole members. New games release in ABBetting. This June is packed with a series of new games to play with ABBetting. However, in order to minimize any errors we may have in the system, the withdrawal feature of ABlotto and ABBetting is temporarily disabled. Within the next 2 or 3 days after making sure that the ABBetting run well with the launching of these games, we will continue to process your Withdrawal Request. This means that Withdrawal function will work as normally after 2 -3 days from the time writing. Be sure to revisit our community channels (Telegram, Reddit, Twitter…) and the website often as we are a fast-moving platform with a lot of changes and updates. I am check in website on your plan, It's truly interesting. Arguable business, flawless logo, very nice results. Good luck fellows! Thanks mate! So excited to know your kind thoughts on our project. We are trying everday to prove that real cryptocurrency can make a real world. These are our games for today betting. It would be great if you can multiplier your BANK with your right bet. First of all, we would like to give you our apology for delaying your activities on stocks.exchange due to the issue announced yesterday. Now we are writing to give you our conclusion for that. First, while ABBetting has been getting its new parts completed (4 new game released), the system was hacked by the anonymous with the amount of 1.8 Mil BANK causing the dumping of BANK on stocks.exchange yesterday. However, with the effort of the team, we have bought back 1.4 Mil BANK. This is an unpredicted accident to the system and we have done our best to protect BANK and our investors. We hope that all you guys can sympathize and give us time to recover. After this case, it’s a must to say that BankCoin is become so popular and powerful that outsiders are trying to attack us and get benefits though we consecutively upgrade the security system. Anyway, learning from this experience, we are well aware that the team will make greater focus on the security of the platform to protect our BANK and investors. In this announcement, we also want to remind you that all activities in BankCoin, ABLotto, ABBetting and Beta version of BankCex are in normal running. They all are available for our users to join. But, as informed before, we are still waiting until the 4 game release appears to be bug-free, afterward withdrawal function in ABLotto and ABBetting will be re-opened. Finally, as required from some members, we are giving you a brief explanation about the pre-mined BANK that has been mentioned recently. As a lot of BankCoiners may know, this pre-mined amount is reserved for coming parts built for BankCoin ecosystem because BankCoin is a long-term project and we have no idea to stop here by dumping as you suspected. Furthermore, the project also use these reserved BANK to host our promotion programs as Bounty, Contest, etc. Hope that you can get our points and ease to stay here with us. Warm regards from BankCoin team. This Whitepaper reflects the recent business growth and evolvement. As a result of this update, BankCex launching timeline has been reduced and expected to reach it scheduled date in late of August. ABBetting has also been added to BankCoin ecosystem full-filling the project with a practical and powerful branch. This remarkable move is thanks to our true investors, beloved fans, dedicated sub-admins and hard-working developers. BankCoin team promise to keep working for the project with great effort and belief for other innovative features. Simultaneously, we will always listen to you well in order to be a good learner from your feedback and comments. If you have any questions or opinions, please share those with us through our social media. We want to make your participation cooler than ever! BankCoin – BankCex Security Enhancement System. Learning from the lessons of Binance and BankCoin ourselves about the recent attacks to the platform, our team have conducted a lot of researches and studies to equip BankCex Exchange with the most effective and powerful security enhancement methods. As planned, we will implement two security modules turning BankCex the safest and most stable exchange for you to enjoy your trading. The first one is Risk Warning Module. It is built as an extremely essential part in our exchange assuring the stability and security of the exchange in terms of development and operation. 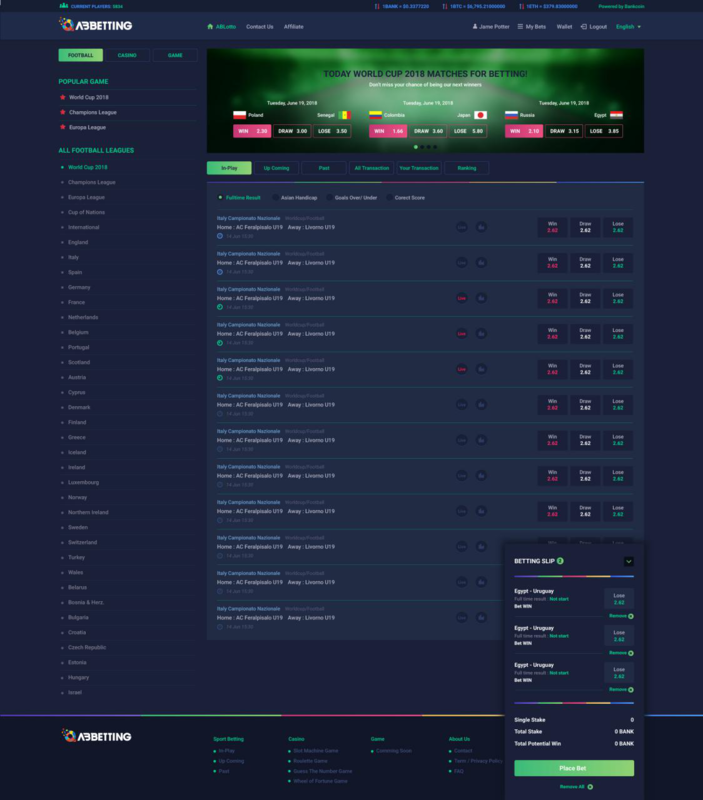 A lot of intensive researches and studies have been conducted to build a powerful AI bot system allowing a strict and full-time monitor to work and track every single unusual signals in the platform based on transaction, trading and other softs of data. This module plays a key role in enhancing the security and stability of the platform and is put on top of priority for further researches. The other module is Early Warning Systems for Currency Crises with Real-Time. In fact, currency crises will be costly, particularly when they lead to severe debt, loss or banking crises. It is therefore vital to signal currency crises in a timely manner such that a crisis can be avoided, or the impact can be eliminated. BankCex is developing this Early warning systems models that can send a signal well in advance of a crisis. The module will base on early estimates in the predictions worsens the ability of early warning systems to signal crises compared to the most recently available information. With this advanced tool, BankCex can keep well informed with the potential risks and detect them at a very early stage. Let’s see how they work for the platform and our investors. Thanks for you love and confidence on us so far.